Ministers have announced more than £8m for new woodlands and road improvements for Phase 2a of the new high speed rail line. HS2 Ltd has also announced plans to plant seven million new trees alongside Phase 1. The Department for Transport (DfT) announced £6.5m for local authorities on the Birmingham to Crewe route through the HS2 Road Safety Fund, ‘to deliver improvements for pedestrians, cyclists and drivers’. The cash adds to the £30m for road safety improvements on the Phase 1 route announced last year. HS2 Minister Nusrat Ghani also announced £2m for the HS2 Woodland Fund, to help landowners along the route between Birmingham and Crewe (Phase 2a) plant new trees native to the area. 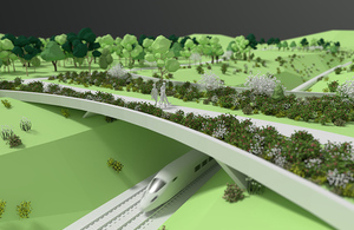 Animation depicting a 'green bridge' along the HS2 route. Although the DfT described the £8.5m funding as 'extra', it confirmed to Transport Network that the case comes from HS2's existing budgets, which total 56bn. The Government-owned firm claimed that the environmental works would be largest ever undertaken by an infrastructure project in the UK and would ‘set new standards for how Britain and the rest of Europe builds the next generation of major infrastructure projects’. Seven million new trees and shrubs, including over 40 native species, specific to each location. The new native woodlands will cover over nine square kilometres of land.